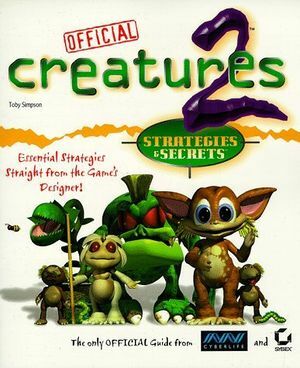 Creatures 2 - Official Strategies & Secrets (ISBN 978-0782124408) is a book written by Toby Simpson. It describes Creatures 2 and provides a good guide for new players - although much of the information presented in it is available in more detail on various community websites, it does collect it in one place in an offline format. It is available from Amazon (UK/US). As its title would suggest, the book does go into quite a bit of detail and gives numerous tips and tricks (for example, what to do in the case of unconscious norns). Unfortunately the release of this strategy guide was closely timed with the US release of the game, it contained some things (such as the above tip) that users felt should have been included in the manual. This led some to believe that Cyberlife had deliberately left things out of the manual, while it is more likely that they were assuming that the C2 norn genome would successfully retain the training imparted by users - in many cases it did not, leading to OHSS - or were required to simplify the manual by the publishers. This was discussed in some extent on alt.games.creatures. This page was last modified on 3 July 2017, at 06:43.